I got up in no hurry this morning. Although I have woke up close to six each morning I have felt no need to leave the warmth of my sleeping bag and rush right out into the cold and fog. It is nice to get up in the morning and not have to be anywhere at a certain time. I was thinking that I should get a good start this morning since I had to drive back into Elgin to get some ice and gas before heading over to the Wenaha. But what’s the rush? The river wasn’t going anywhere. As I headed out I stopped at Bart and Collin’s camp to give them one last farewell and wish them better catching on the Imnaha. After getting gas and ice in Elgin I was back on my way. I could have taken the road back to Palmer Junction and then over the mountain to Troy, but I decided to take the Promise Rd. that comes down at Powwatka so I could see how many people were shoulder to shoulder on the Grande Ronde. And there were plenty. There were quite a few people mounted on rafts, catarafts, and inflatable kayaks besides the numerous bank fisherman. If I didn’t let steelhead fever take hold of me so much, I might have admonished them for crowding the river. 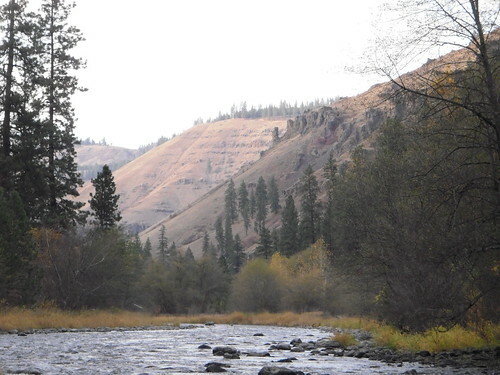 I soon arrived at the Grizzly Flats camping area along the Wenaha. There were only two other tents set up, so there was plenty of room to stay spaced apart. When I got out of my Explorer (Yep, I got a new exploring rig) I heard the hiss of air coming out of one of my new tires. I didn’t really want to take the time to change a flat tire since I was getting to the river a little late. I figured there would be plenty of time in the dark for changing a flat. My original plan was to walk up the trail three or so miles and then fish back to camp. Since I was starting out late I decided to start fishing up the river and just walk back before it got dark. There was an Isuzu Trooper parked at a tent at the upstream end of the parking area and there was a small run right there on the river. I almost passed it, but decided to throw my flies in at the last minute. I drifted through the small run and then as my flies started to swing I gave my line a few short strips and my flies stopped. I set the hook . . . Nothing, I got a rock. But Wait! That rock is swimming. I had a steelhead on with my first cast. The steelhead made a big leap out of the water. She fought well but I eventually I got the beautiful wild hen to the shoreline. Whew! Pressure is off now I thought. I have caught steelhead in 5 different rivers this week now. It may be the only steelhead I catch out of the Wenaha. I fished my way upriver the rest of the day without catching another steelhead. I did however catch quite a few rainbows. I didn’t get any real big ones this time, but I did catch a nice 12”-14” rainbow. To my surprise I only caught one bull trout and that happened in a weird sort of way. I was fishing a run a couple of miles upriver from Troy when I hooked a nice rainbow. It bailed out of the water a couple of times and I could see it was a pretty nice fish. It also had quite a bit of pull. 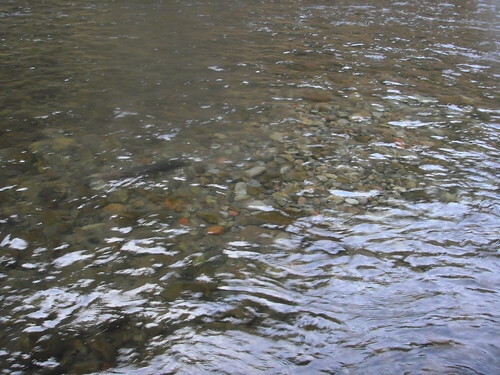 Then the fish got really erratic and I was pretty sure there was a bull trout after him. Then I could see two tail fins. One brownish golden that was pointing downriver and one with a red stripe in front of it, but the tail was pointing perpendicular to the river. My rod got really heavy as well. The bull trout was putting the chomp down on the rainbow and that was no small rainbow to take hold of mid-section. I tried to pull both of the fish in, but somewhere in the bull trout/rainbow trout struggle the bull trout got caught on my bottom fly (I was fishing a three fly rig) and the rainbow had escaped the clutch of my fly and the bull trout’s jaws. Wow! That was a true struggle of life and death for the rainbow. I learned something new about the Wenaha today as well. There are apparently some fall Chinook in the Wenaha. I don’t know how many, but I saw two Chinook on two different redds. I am also not sure if they utilize the full length of the Wenaha like the spring Chinook do, or since the lower river is at an acceptable water temperature this time of year perhaps they just use the lower end of it. With as few as I saw, I would presume it must be a pretty small fall run unless they use the upper river more. I fished a little over 3 miles upriver and then decided I would hit the trail and head back to camp. I had a tire waiting for me. On the walk back I went back and forth trying to decide if I would head home and have one day to regroup or just fish Sunday and get back late. By the time I got back to my flat tire, I thought I would fish part of the day on Sunday and get home late afternoon or early evening. This morning when I awoke in the dark to the pitter-patter of rain on the roof of my Explorer, I started thinking that 8 days of steelhead fishing was probably good enough. It was not that the rain bothered me. 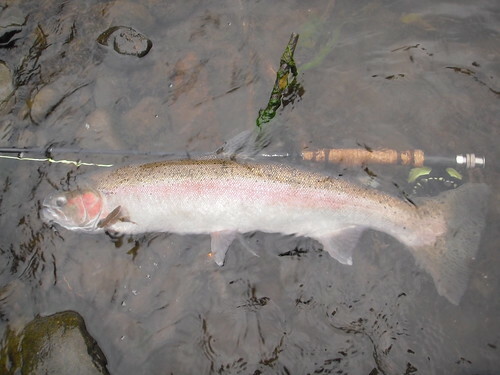 Steelhead fishing is often the best with a bit of rain. 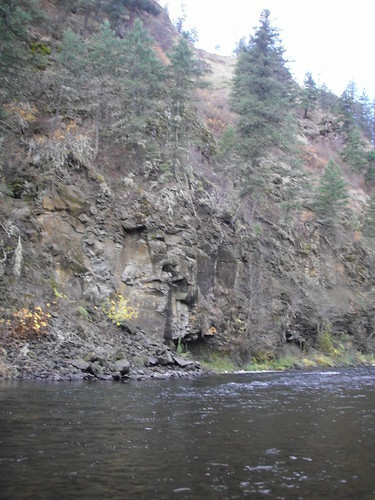 But If I fished the Wenaha today, I was going to walk up the river 5 miles and then fish downstream back to camp. And it would probably end up being late before I got home no matter what. When the light finally came to the canyon I decided I would surprise my wife and come home early. This entry was posted in Steelhead Marathon 2010, Wenaha. Bookmark the permalink. Once again Grant you have provided me with some great stories of your adventures. I have a old High School buddy that resides in LaGrande. He doesn’t have a computer and I have printed all of your adventures. He enjoys reading them as much as I do. He retired from Boise Cascade in Elgin and has spent his whole life in Eastern Oregon and consequently he is very familiar with each of the areas you have visited with one exception and that is Joseph Canyon. Thanks again for a delightful read. I am glad you enjoyed them Richard, it is always nice to hear.